Elk Grove Mayor Steve Ly revealed that he attended a recent retail conference in Las Vegas. 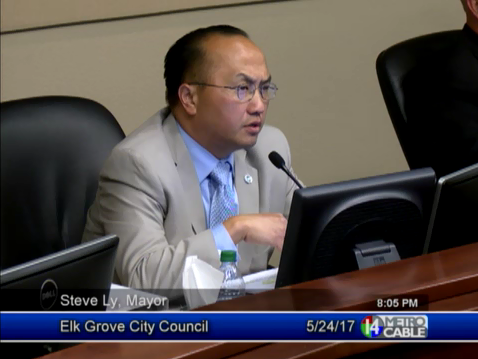 The revelation came at tonight's Elk Grove City Council meeting when Ly said he attended the International Council of Shopping Center retail convention, nick-named Recon 17. Ly attended with the City's economic development director, Darrell Doan. In the past, participation at the conference was justified as a way to promote the unfinished Outlet Collection at Elk Grove shopping center owned by Howard Hughes Corporation to possible retailers. As part of his attendance at last year's Las Vegas conference, Doan sought the help of the Wilton Rancheria to schedule a meeting with their underwriter for the proposed $400 million casino resorts tentatively scheduled for location at the Outlet Collection at Elk Grove, Las Vegas-based Boyd Gaming. Even though the City at the time of the conference claimed to be neutral regarding the proposed casino, emails from Doan to Wilton Rancheria Chairman Raymond Hitchcock indicated otherwise. Doan urged Hitchcock to "Make sure they know we are supportive." In his comments, Ly said he was not aware of the enormity of the convention. "I didn't fully appreciate how large it was until I showed up," he said. According to the website for the event, there were over 35,000 attendees and 1,200 exhibitors, one of which includes Birmingham, Ala.-based Retail Strategies, who Elk Grove recently retained to act as a leasing agent for the city. The conference started on May 20 and concluded today. Although Ly did not specify his activities or the purpose for his attendance, he acknowledged a meeting with Retail Strategies. After meeting with them, Ly said he expects they will provide the Council and the City with the guidance they need to properly perform their tasks. "I had an opportunity to sit down with Retail Strategies," Ly said. "They shared some really good ideas and that is going to be beneficial for the city and the council to have an independent party that is going to come in provide us the tools so we can make good, sound decisions." "Easy Mark" Elk Grove in attendance at ICSC this year. Consultants, please do not stampede their booth, someone might get hurt! It will be interesting to see if Mr. Ly used this taxpayer provided junket to raise any money for his campaign fund. Perhaps a contribution from Retail Strategies, or better yet, Boyd Gaming will show up on this summer's financial disclosures. Oh yes, Mr. Ly before we forget, how was the casino buffet line?